Here are some recent Bald Eagle sightings from our readers. Scott Schlegel wrote to tell us ..... This past Labour day Monday, my family and I were taking the last boat ride of the summer at Conestoga Lake, when my brother pointed up. Above us was a large bird chasing another, albeit slightly smaller bird. After gazing for several seconds, it turned out to be a Bald Eagle chasing an Osprey. This went on for a good 30 seconds until the Osprey dropped something out of it's talons and flew away. 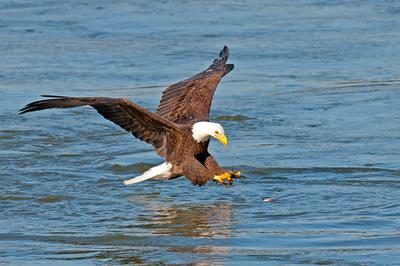 The Eagle descended to the water and grabbed the fish. Ted Toner from Sundridge, Ontario, reported in December ..... Just behind my cottage on Lake Bernard, we observed a Bald Eagle flying overhead. We continued watching as saw it fly downward behind a tree line behind my cottage by the road. We continued watching for several days and spotted a second Eagle flying alongside of the other. A few weeks later I noticed two Eagles sitting on the beach in front of my cottage. Then my eyes were distracted by a movement on my front lawn by the beach to see a third very small Eagle which I now know is the Baby Eagle. I observed these up until Thanksgiving week-end when I had to close up for another year. I will be back in the Spring and so will they. Larry and Kate from Howe Island wrote to say ..... A beautiful pair of Bald Eagles has taken a liking to the tall poplars on our south shore property on Howe Island. They have been around almost 2 weeks now. bridge over the Grand River, I saw a young Bald Eagle flying low down the Grand River, south of the highway. I was in the hammer lane and only got a glance, it appeared to be hunting in the shallow part of the river. It was gliding below the tree line and for just a moment I only saw trees sky and Eagle, it would have made a beautiful picture. It made my day. In October David and Gwenn England of Lake of Bays wrote ..... Sitting on our patio on Haystack Bay, on Lake of Bays near Dwight, my wife commented on a large bird swooping low over the calm waters of the bay. Clearly it was not a turkey vulture and I immediately ran for my camera. With several clear shots and a quick check of our reference book we felt we had seen either female or immature bald eagle. Having been on the lake for 13 years and ever observant of the abundant wildlife we where thrilled by this sighting and have been looking for another exciting visit. Candice wrote from Sparrow Lake, south of Gravenhurst to say ..... For the second morning in a row I have seen a beautiful Eagle fly across our bay. He's not overly large, but he's a good size, so I think it may be a Bald Eagle. He has a white head and white tail. I'm a little concerned about my Maltese dogs. Bill from Hamilton said ..... I have seen a Bald Eagle standing in the water in the Grand River in Caledonia about 300 yards downstream of the dam. A reader wrote to say ..... Spotted a Bald Eagle at Jackson's Point. Very exciting! Camera phone not up to the task.